Mallorca has several fantastic cycling routes and like Cap Formentor and Sa Calobra, Puig Major is one of them. 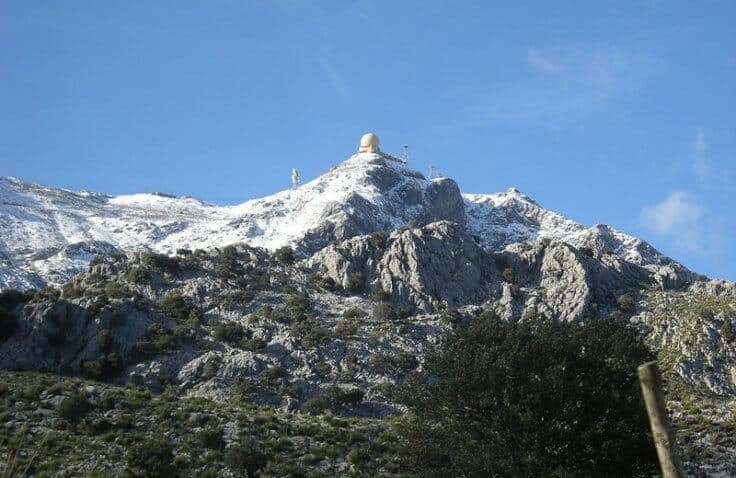 In fact Puig Major, which is part of the Tramuntana mountain range is the second most popular climb on the island, thanks mostly to being the highest reachable point. When you reach the top of this 14 kilometre trek you will be 854 metres above sea level. The most popular climb on the island is Sa Calobra made famous by Sir Bradley Wiggins who used the hairpins to train before the 2012 Olympic Games. When you ride Puig Major you will ride a steady 6% gradient. The real challenge is the 14kms of route to reach it. Starting from Soller which is at sea level, you ride the Ma-10 until you reach the Monnaber Tunnel, the summit of Puig Major. Like most roads in Mallorca, the road is perfect for cycling, as it is long, winding, and smooth. The steady gradient you will feel in your legs but the gradients never reach the dizzy inclinations of 10%+ that you would find on say Mont Ventoux. If you’re not trying to achieve a personal best then you may want to stop and refill your water bottles and have a coffee in the village of Fornalutx. It states that it is the “prettiest village in Spain” and it could well be. It is situated at the top of the Soller valley and has wonderful mountain views. It has a number of cafes and restaurants to refuel and refill, and you will notice the olive and orange trees which stretch all the way to your destination, Puig Major. To reach Fornalutx you take a small detour from the Ma-10 about 4 kms into the climb. An alternative from the popular Soller route is to begin the climb at Carretera de Fornalutx taking the Ma-2121 road which will take you through Fornalutx. This is the only difference in the route, however, as from Fornalutx you take the MA-10, riding the last 10 kms on the same road as the Soller route. The views from Puig Major have to be experienced. The view of the sea and the mountains and valleys below give you a perspective few in the world will ever get to appreciate. You will also have that beautiful feeling of achievement from riding to the highest point on Mallorca. Make sure you have your phone or camera with you to take pictures. Your taxi for whatsapp! We offer our service to request your taxi, by Phone: 627754452 with the application “Whatsapp”.